So, the last time I posted an update about progress in the garden at our house was in August. August 2010, that is. I really don’t know what my problem is. I guess my hesitancy to post about it is in part because we’ve been living in this house for nearly 7 years now, and there’s just no good excuse as to why the garden isn’t DONE, already. I took these photos a few months ago after we’d finally assembled the recessed planters, and I figured I’d post them a week later since by that time we’d have actual plants in them…but yeah, that never happened. The summer was hot and hectic, and there wasn’t any time to do it. Also mosquitoes. And no, I don’t know why that photo is angled. I swear I wasn’t trying to be artsy. I was hanging out of a window on the second floor when I took it, so maybe I was just trying to avoid plummeting to my death and wasn’t really focused on the composition. I did manage to cover most of the exposed dirt with mulch, which was a relief. My eventual goal is to only have “living mulch” (creeping, low-lying plants) and rocks in those areas, but it’ll take a while to fill in. Having to spend hours weeding that area every week was making me crazy, and the bare dirt was washing down over the paving stones every time it rained. So, for the time being, mulch is making life much easier. I also planted lots of creeping Jenny between the paving stones, and it started spreading right away. I bought two big plants and divided them because that’s much less expensive than buying lots of tiny plants. Creeping Jenny does really well in our soil, and I love the contrast of the bright yellow-green against the concrete pavers. Next summer I’ll plant more in other areas, too. I’m not sure what happened to 2011 in terms of gardening. We did spent a LOT of time carrying gravel out there to cover all of the old, broken concrete that extends about 10 feet from the back of the house. Having the concrete removed and replaced with slate or something else would have been too expensive, so the gravel cover-up has worked out really nicely instead. Anything we put in the garden has to be carried (by hand) from our car in the street down the front basement stairs, through the basement and then back up the (precarious) rear basement stairs. Our house is attached on one side and we have a “difficult” neighbor on the other side, so we have no access points to the garden that don’t involved stairs and basements. So yeah, we carried all of the deck wood, the foundation blocks, the pavers, the plants and the gravel through the basement. Slowly. Which is part of why this has all taken forever. I’m very pleased that the fence has finally weathered to a nice gray, and that the deck is also looking more worn-in. We’d initially planned to stain it, but it looks like procrastination has paid off for once because I like it better looking natural. I’m sure we’ll have to treat it with oil or something eventually, but for now it’s fine. FACT: Strings of lights make everything look better immediately. I bought two packs of cheap $12 dorm-room globe lights at Target and put them up back in June when Lisa, Victoria and Jenna came to visit. They’re just looped around the fence tops, so (in theory) I can easily take them down this winter, but they’re also rated for outdoor use, so (in reality) I can leave them up all year round. They make the garden feel so cozy at night. 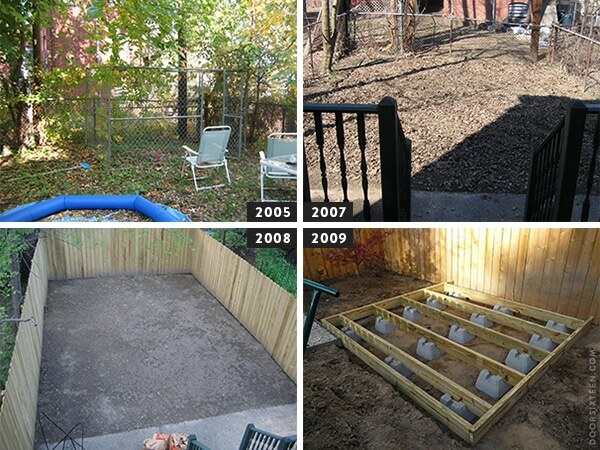 It’s fun to look at these garden progress photos from over the years! It’s pretty much unrecognizable from the chain link fence/dog kennel/inflatable swimming pool/weed extravaganza that was going on back there when we saw the house for the first time in 2005. Like I’ve said so many times before, Evan and I have no idea what we’re doing. We just figure it all out as we go along. I’m glad we’ve somehow managed to wind up with a garden that looks approximately like what we envisioned, since we couldn’t have afforded to pay someone else to do it for us. I still refer to these photos often. 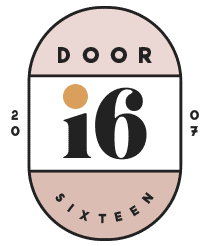 That issue of Domino came out literally the same month we closed on the house in early 2006, and I think I should probably send Susan Welti a thank you card for sharing her design work publicly. 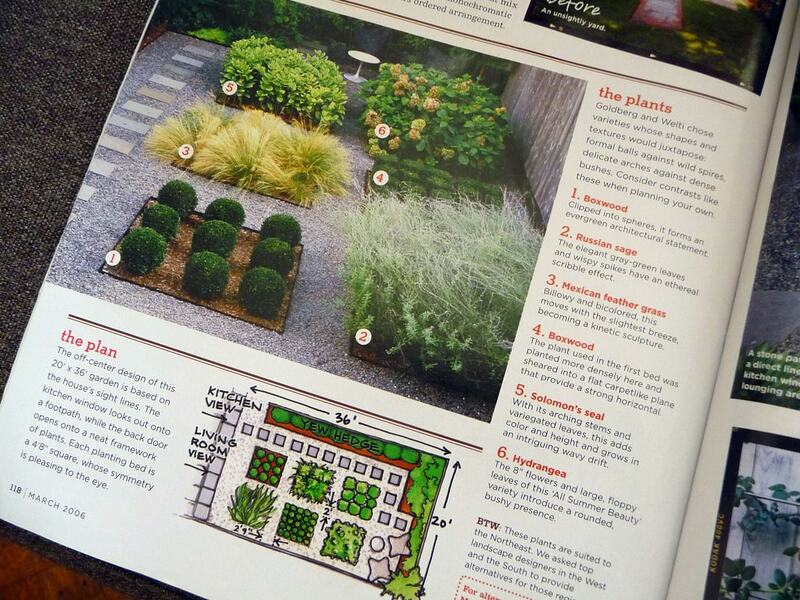 She even provided a garden map and a plant list in the issue, which has been really helpful! Next summer I’m hoping to get some Mexican feather grass and Solomon’s seal into our recessed planters. Colors! 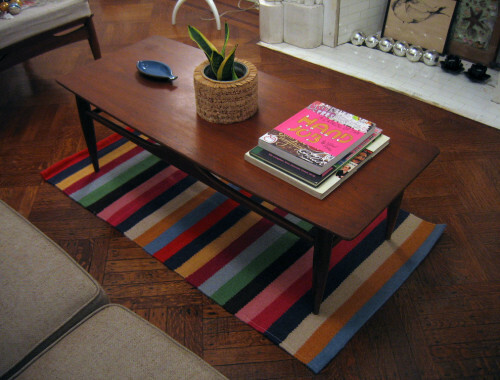 And a coffee table after all, maybe. White, gray, and a little bit of color. This looks amazing, Anna! You and your husband have done some great work back there. I’m always so inspired by the work you guys put in on your home. We have a teeny tiny place over here and progress is so slow, but sometimes I think that’s the best way. dean riddle turned me on to creeping jenny. chartreuse is pretty much my favorite. he gardens in your neck of the woods and wrote the very best gardening book ever. five stars. That looks like a great book, Jeannette, thanks! You garden looks amazing. Was the fence something you were able to put up yourself or did you have to hire someone? Thanks, Peggy! We hired someone to put the fence up for us. Here’s a post I wrote about it. It wasn’t so much that we wouldn’t have been able to put the actual fence up, but more that transporting all of the panels and post and cement and such to our house (and carrying it all through the basement!) would have been too difficult. In the end it wound up being well worth the money, since our garden slopes much more than we’d realized (almost a whole foot across the width) and the fence guy had to do some complicated math and cutting in order to make it look visually correct. We did have to sacrifice using nicer wood or doing a custom horizontal fence in favor of paying for labor, but I’m glad we made that choice! I mean, i clearly trust her, i know nothing, ha, but i want whatever it is! LONG time stalker here, first time commenter. 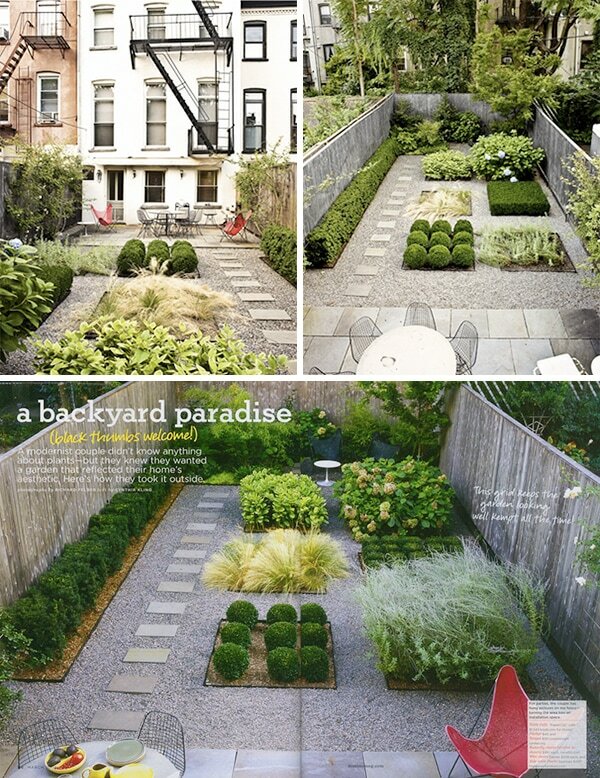 Ok so, we’ve been looking at doing something similar with part of our own (much larger) backyard. My question is, is $50/ea a decent price for a butterfly chair (frame)? There’s a local retro/industrial salvage shop with four of them for $50 a piece. I could probably talk them down ~$10. Would $160 for four be too much? I would still need to buy the covers. Leo, it’s always really hard to answer that kind of question because there are so many variables. Most importantly: Are the chairs actually made by Knoll, or are they knockoffs? Do you care? 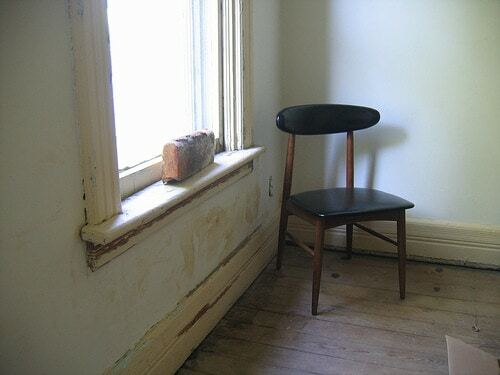 The Hardoy/butterfly chair is one of the most copied chair designs ever, so even if the frame is vintage, it’s very hard to know the exact provenance. If you don’t care about the authenticity, then it really just becomes a question of how much is in your chair budget, whether these chairs will meet your needs, and if they’re good, sturdy quality in decent shape (no rust or re-joins, etc.). Speaking for myself, I would spend the $160 for the frames and then head over to Circa50 to order a set of covers made from their indoor/outdoor woven vinyl fabric. It’ll still be cheaper than buying a contemporary knockoff. Anna, I am relatively certain they are authentic Knoll/ Hardoy. I sort of care, but not really. They look the part. Is there any way to actually tell whether they are authentic, like a mark or something? The store seems to think they are legit. They are the earlier non-foldy type, and are somewhat rusted and flaking, but seemingly sturdy. That said, I have a bit of a chair-addiction, so maybe I should hold off. They’ve been there for a few months. Then again, it might be worn the risk. I found a really disgusting, badly spray-painted peach eames side shell with a swivel base for $20 there that turned out to be elephant-hide grey. No, the old chairs don’t have any kind of mark on the frame. I don’t personally think it matters…not with something like that. I’ve never ordered from Circa50 (the people I bought my chairs from had the covers custom made for them out of Sunbrella fabric), but I know several people who have and they’ve got nothing but positive things to say about the service and quality. I say buy ’em. You know if you go back in a few months and they’re gone that you’re going to wish you’d bought them! And yes, I am a total enabler. Garden is the hardest thing for me since I have very little patience along with a very little budget and waiting for things to grow and become established sometimes feels painstaking. Yours is progressing so nicely! Though, I you wouldn’t have sold your inflatable pool complete with leaves and debris to my neighbors because they store it behind their garage where they can’t see it but we can! Trashes up my view. Sherry, I sympathize with you. I hope they don’t use blue tarps. Our otherwise lovely view has been sullied by various bright blue tarps and a bright blue swimming pool for years. Finally, this summer we decided to strategically transplant some large rhododendrons in order to minimize the impact a bit. In the meantime, our otherwise very nice next door neighbor decided to put a bunch of junk next to his house (right outside one of our windows) and cover it with a bright blue tarp. And after Sandy we decided to have some trees cut down on the other side of the house in preparation for the next storm, but now we can see more of that neighbor too. You can probably guess what color his house is? Now that I’ve had a chance to get this off my chest, I should point out that I still prefer a neighborhood where people can do what makes them happy (even blue tarps) compared to places where everything has to conform to certain standards that seem designed to segregate. There are many places now where you’re not allowed to have an above ground pool or park certain kinds of vehicles in your driveway – such things would be evidence that a working class person, or similar riff-raff, lives there. I would advice planting some fast growing evergreens ASAP. I’m considering some hemlocks next summer. If you are still young you can buy the smaller size. Well, you know I agree with you in principle…BUT…allow me to play devil’s advocate! How far do you extend those beliefs? What would you reaction be if the City of Newburgh suspended all historical restoration guidelines and everyone was allowed to put vinyl siding and plastic windows all over their Victorian houses? After all, repointing and maintaining brick is much costlier and more time consuming in the short-term than the forbidden alternatives. Shouldn’t we care more about people—ESPECIALLY in a city like Newburgh, where the average income is very very low—than we do about houses? It looks great! I’m so envious of the tree/bushes in the back–it looks so lush. I think gardens are kind of like houses, though–you’re never really DONE–there is always something else you’d like to do, or something that didn’t work out that needs to be replaced. Oh my goodness Anna, it looks great! I remember your original post and I remember the original photos you shared and really you are not giving yourself and your husband enough credit. The two of you have done the two absolute hardest parts getting started and doing the hardscaping. I don’t know what it is like to garden in NY this time of year but for me fall is the best time to plant that way roots can develop during the fall and winter giving you healthier spring plants–just something to keep in mind if your ground is not frozen. This looks great! I love how open it is with all the color from greenery. A place to sit and relax too! Your yard looks amazing! 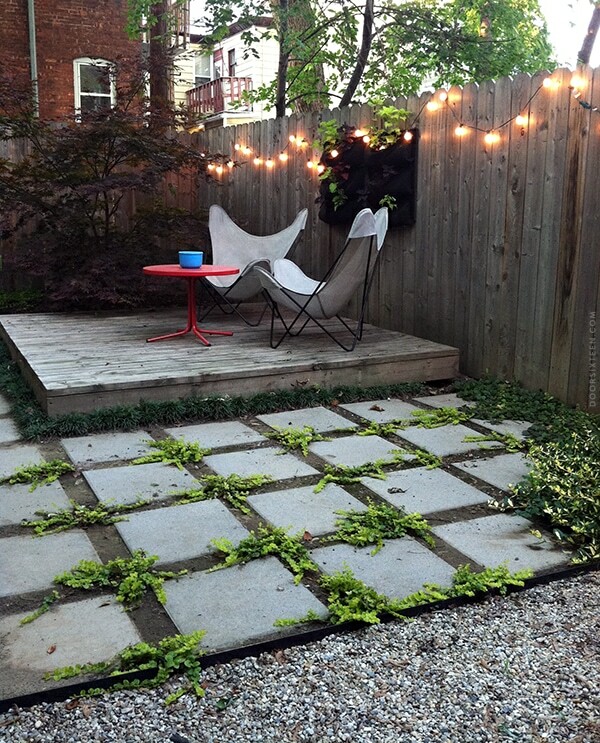 The creeping Jenny is a good idea between the pavers. I planted a bit between our bluestone patio in our yard and it’s grown in crazy good! Your garden is looking great. All the different stages, how it differs so greatly from the original mess back there, it has really happened quickly. Gardens take time, yours is going to look fantastic for years. There are so many points to look at within the garden, it has such definition those recessed planters are going to look so great when they’re filled with the solomon’s seal and the feathered grass. The hard elements against the soft plantings, so pretty. There are so many ornamental grasses to choose from, do you think you’ll stick with the Mexican one, or go for something with more height or even a colour against the tree at the back (you’re putting the grass in the back box, right)? A few years ago, I saw this kochia scopaira grass, it was amazing. It will be exciting to see the finished project in the summer of 2013 (then in three years in 2016 when it will really be ‘showing’). Anna, this looks so great! As usual, you made great choices with what you’ve done. One question — which I hope doesn’t sound silly — do the rocks you laid on top of the concrete slip at all? We’ve thought of doing something similar on our small patio, but I’m worried the stones would act like small ball bearings. Thank you, Reba! 🙂 No, the gravel doesn’t slip at all. We put about 1-2″ down, though (variable depth in order to level out the surface), so it has a lot of weight to it. Also, the concrete we put it on top of has a very coarse aggregate in it and had suffered a lot of cracks/breakage over the years, so it has a lot of “grip” to it. Maybe gravel on polished concrete would slip around? I’m not sure! I’d suggest just buying one bag of pea gravel and testing it out to see how it works on your patio. I love admiring a nice garden but actually producing and maintaining said garden has been much more work than I anticipated. We were lucky to inherit a yard laid out by someone with a green thumb, and there are lots of pretty perennials and shrubs there (it wouldn’t be your style at all, Anna, but it is lush and green). But we have these crazy-deep flower beds that need constant weeding to look presentable. And we are not even close to constant weeding, so what starts of fresh in spring looks like a mess by summer. Eventually we’d like to start over completely from scratch, eliminate our grass entirely, streamline the flowerbeds significantly. But it’s all going to take time and, of course, money. Your garden is looking beautiful! I admire how you actually used the Domino pictures for inspiration in the true sense of the word (rather than just trying to affect as close a copy as possible). I can see the influence of the Welti design, but your backyard is still unique . You struck a great balance between structured and natural. Love this. It’s modern and simple. I just started working on mine last year when I moved out of the city and got some outdoor space for the first time. So much fun, but it’s a lot of work and expense. Thanks for making me feel better about the realistic time it takes to get the work done! Looking fantastic! Look how far you’ve come. Love that you built the deck yourselves. Our garden is planted, but we still have the chain link fence and out of control weed issue. Oops. Hey Anna! Love your garden so far! 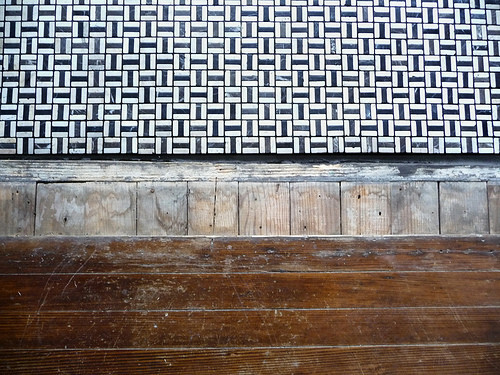 I was wondering – did you create and/or use a tutorial or other resource for your grid of square pavers? I’m looking for detailed instructions on how to create a similar-looking surface. What fun! This is inspiring to me, as our back yard is taking a LONG time too. We had a lot of dry dirt and we’ve mulched it a couple of times. I like the twinkly lights! May have to try that trick. Thanks for sharing your photos. Lovely back yard. What is the black material hanging from your fence (beind the chairs)? Wow! I was impressed even before I saw the BEFORE shots. I think it looks fabulous, and I have been referring to that same Domino pic for as many years – it’s one that really stuck in my mind. Anyhoo, the proportions in your garden are just right on as well – very pleasing. congrats and can’t wait to see it in spring 2013. Hi, I’ve been a fan of your website quite a while. And your back yard looks great! I love the purple tree in the corner. Could you tell me the name,please? Since I’m living in CA, I’m not sure if it can do well in here. Hi Maiko, it’s a Japanese maple—the name of the variety is “fireglow.” During the spring and fall it’s very bright red! Thank you so much, Anna! I really appreciate it! 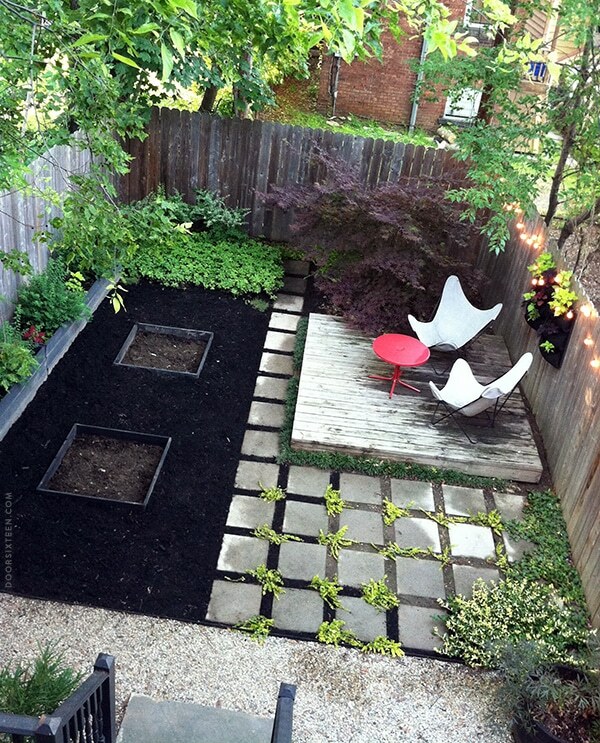 freakin’ love your outdoor space!! Creeping over from YHL, your garden is lovely. Have you thought of thyme (perennial not herb) for the garden, it is a low lying creeper, durable, hearty (I live in eastern Canada and it grows here) and releases a lovely scent when walked on.